Ironically, as I sit down to write up this blog which is eventually going to discuss solar energy, the weather here in Tucson is astonishingly wintry. Three Pacific storms are blowing by this week, each one bringing more rain and wind than the previous one. Last night we heard the unfamiliar sound of heavy rain pounding our flat house roof in the desert, and this morning we woke to crystal clear air, sidewalks and driveways scrubbed clean of dust, a few downed palm fronds, and beautiful views of snow in the Catalinas above 6,000 feet. 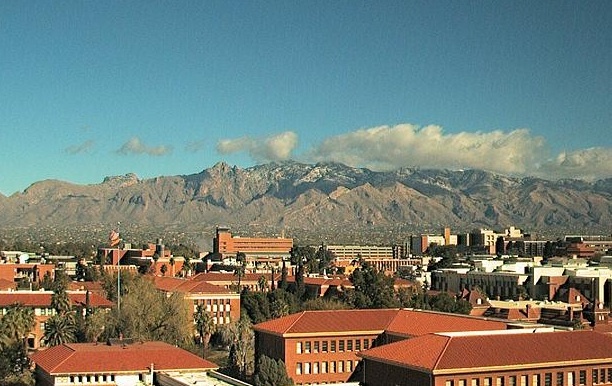 Webcam image courtesy of UA Computer Science Dept. Even when our forecast looks like this, it’s usually sunny most of the day in Tucson. They get excited about rain here, for obvious reasons, and a “winter storm” has an entirely different meaning than it does in the rest of the country. Here, it means wind, a little rain, and maybe a thunderstorm. “100% chance of showers” doesn’t mean rain all day; it means definite rain at some point in the day. Freezes are rare except in the mountains. Normally after a big snow we’d go sledding in the mountains, but Emma has one foot in a cast that can’t get wet, and she can’t climb snowy hills anyway. Broken fifth metatarsal, nothing serious. And we’ve got carnies in the driveway, and I’m afraid to leave the house unguarded while they’re here. (Just kidding, they’ve been good courtesy parkers). So instead of karate, hiking, biking, and sledding, we’re forced to some sedentary activities like cheap Tuesday night movies and Tucson Roller Derby. The ladies of TRD put on a good show Saturday and now Emma is sporting a cast covered with the autographs of roller derby queens, which is just extremely cool. Not everyone has the autograph of Bev Rage, Furious Oxide, Pinky McLovin, Hellbent Betty, Zippy’s Takeout, Dirty Duchess, Blanka Trohl, and others on their foot. Rich, it seems that I get more real world data from your blog than most ‘data’ sources… Have you ever logged hour-by-hour amp output from your 230 W solar system under ideal conditions? I see your daily totals and they seem well below the system theoreticals … Thanks! I often watch real-time amp-hour output from the panels and I’ve found that theoretical output is not very useful in the real world. There is huge variation depending on sun angle, time of year, time of day, cloudiness, dust on the panels, and shading from trees. There’s also some loss inherent in the wiring. As a result, on a sunny day at noon we might generate as little as 8 amps, and as much as 12 amps. The rest of the day the output will be considerably less. In December, even on a clear day, output will generally run less than 3 amps until 9 a.m., and after 3 p.m. Thus, on a clear winter day we might generate just 25 amp-hours per day. On a partly-cloudy day, that can be cut to as little as 15-20 amp-hours, which is not much at all. But under “ideal conditions,” we can generate quite a lot more. In late June or early July with full sun and 16-hour northern daylight, we could certainly produce more than 60 amp-hours per day. We’ve never been able to measure our true total potential capability because, ironically, you generally need the least power in summer when it is most easily generated. Thus, our batteries are always full by 2 or 3 p.m. in the summer. Once the batteries begin to reach full charge, the system stops absorbing power and we have no way to determine accurately how much more power we might have been able to store. Winter is the relevant challenge. That’s when you have short days, low sun angle, and much higher power consumption due to increased furnace and light requirements. It takes a powerful solar charging system and good weather conditions, to generate and store enough power to make up a typical day’s use. It is for this reason that I recommend serious boondockers go for much more panel capability than the standard 55-watt installed as part of the Airstream “solar package.” You want to have the power to get through a couple of partly-cloudy winter days if you camp during that season. Having tilting capability on the panels will also boost power production considerably, but this is difficult to implement on an Airstream. The best way to look at it is that solar generally just makes your batteries seem bigger. The other piece of the solar equation is the capability of your solar panel controller. Most solar controller incorporate good charging, so that when you have sun the batteries can enjoy the maximum capacity available. However, when you go plug in (whether to campground power or a generator) your factory-installed power converter kicks in, and those are often pathetically bad at recharging batteries. Read about our experience here. It makes sense to replace the factory converter/charger with a better 3-stage charger if you are going to use a generator to top off your batteries in addition to solar. Be very careful about that public comment on the “carnies”. LOL!!! They play with fire AND swords!!! ha! Glad that you are all having a great visit. How did the brake job go? I’m intrigued by solar panels. Your narrative is perfect for those of us who are thinking about solar installation. One can’t expect ‘ideal’ conditions at all times. Tell Emma to take care of that foot. I want her to show me the kick necessary to deter would-be attackers. Am constantly besieged. Incidentally, learning lots from your postings about solar panels and three-stage chargers. At least I know the questions now to ask. Great post and recommendations on RV solar power. We, like you, ran awhile with better solar charging than shore power charging. The Parallax is a poor choice for us both because of low charge rate and because it lacks ability to float the charge when the batteries don’t need more. We really have no idea just how well our batteries are charged from sunlight until we see the float charge light illuminate. Thanks for the reference to the Trimetric 2020 — this looks like metering we could use.